SPACHEA Adr. Juss. in Deless., Icon. Sel. Pl. 3: 19. 1838 ["1837"]. — Type: S. elegans (Mey.) Adr. Juss. Meckelia (Adr. Juss.) Griseb. in Mart., Fl. Bras. 12(1): 25. 1858. Spachea sect. Meckelia Adr. Juss., Ann. Sci. Nat. Bot., Sér. 2, 13: 326. 1840. — Type: S. tricarpa Adr. Juss. Shrubs or trees; stipules intrapetiolar, completely connate or the pair shallowly bidentate at apex, persistent on petiole; leaves usually bearing glands immersed in both surfaces of lamina, abaxially at base and sometimes distally, adaxially in distal 3/4 (adaxial surface eglandular in S. martiana), the petiole mostly eglandular (rarely biglandular at apex). Inflorescence terminal or lateral, sometimes pendent, an unbranched raceme of few-flowered cincinni or a pseudoraceme of single flowers [1-flowered cincinni]; floriferous peduncles developed; bracteoles persistent, borne below apex of peduncle, one or more often bearing 1 large peltate or cylindrical terminal gland. Plants morphologically gynodioecious but functionally dioecious, the pistillate flowers bearing flat unopened anthers with aborted pollen, the staminate flowers bearing large polleniferous anthers and a small ovary that does not mature into a fruit. 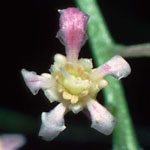 Sepals leaving outermost petals exposed in enlarging bud or imbricated over petals until anthesis, all biglandular (or glands apparently 8–9, perhaps through fusion of adjacent glands), the glands borne on or below free part of sepals; corolla bilaterally symmetrical, the posterior petal slightly to clearly differentiated from the lateral 4; petals pink or white, minutely denticulate or fimbriate, glabrous or with a few hairs at base of claw; androecium radially symmetrical; filaments distinct, alike, glabrous or bearing a few hairs at base; anthers alike, glabrous, all opening to release pollen in flowers on staminate plants, all remaining unopened in flowers on pistillate plants; pollen 3-colporate, the colpi very broad for a byrsonimoid genus; receptacle bearing a ring of basifixed hairs between androecium and gynoecium; gynoecium radially or bilaterally symmetrical; ovary with the carpels 2 or 3, connate along a broad adaxial face; styles as many as carpels, stout, cylindrical, the truncate or broadened stigma sometimes becoming subpeltate or bilobed in anthesis. Cocci 2 or 3, separating from a plane or slightly raised torus, dorsally smooth and rounded. Chromosome number unknown. Six species, one in Cuba, two in southern Central America with one of those also in adjacent Colombia, and three others in northern South America (including Trinidad) [map]. All grow in wet forests, mostly at low elevations, and given the morphology of their fruits it seems safe to assume that the cocci are dispersed by water. That makes the disjunct distributions of the species interesting (see the distribution map); especially surprising is the presence of an endemic, three-carpellate species in Cuba. — Regional key to genera: Caribbean, Central America. Spachea resembles its sister Lophanthera in several characters, especially the glands on the abaxial leaf surface and the glands on the bracteoles in some species. It is distinguished from other genera by several synapomorphies. Most peculiar among those are the glands found on the adaxial leaf surface in all species except the Cuban endemic, S. martiana. Those glands vary from a few at the apex near the margin to more numerous, situated between the midrib and the margin, and distributed well toward the base. Such glands are unique in the family. The styles do not taper to minute stigmas, as in other byrsonimoid genera, but are cylindrical with the apex truncate or flared, sometimes becoming peltate or bilobed, especially in S. elegans. The breeding system is also unique in Spachea. The flowers of all plants contain both stamens and a gynoecium, but on plants that produce fruits the anthers are shrunken and never open, while on plants whose anthers open to release pollen the gynoecium is small and never enlarges to produce a fruit. The hypothesis that the species of Spachea are functionally dioecious was first proposed by W. R. Anderson (1981b) and confirmed experimentally by K. Steiner in 1985 [pdf]. Functional dioecy, while not common in Malpighiaceae, does occur in other clades (see, e.g., W. R. Anderson, 2001b); however, the cryptic dioecy found in Spachea is not known in any other genus. Reference: There is no modern revision of the genus. Etymology: The name of this genus honors Édouard Spach (1801–1879), a French botanist who worked at the Muséum National d'Histoire Naturelle in Paris when Adrien de Jussieu was active there. Uses: None known, except that S. elegans has been cultivated in the Caribbean as an ornamental tree since 1791 (Howard & Clausen, 1980; W. R. Anderson, 1988, p. 633).